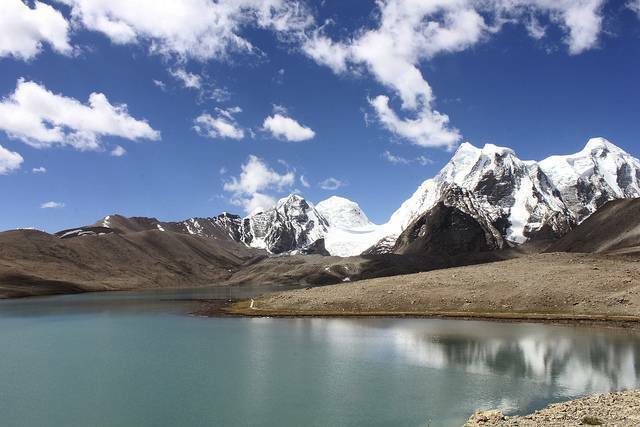 Gurudongmar lake is the second highest lake in the world, situated at an altitude of 17,100 ft (5136 mts). It is about 60 KMs from Lachen, Sikkim and remember to get your visitor's permit in advance. The crystal clear blue water of the lake, which seems to be guarded by the majestic snow-capped mountains surrounding it, is truly a sight to behold. The air is thin at this altitude and lack of sufficient oxygen may take some time for travelers to get used to. Tso Lhamo Lake which is the source of Teesta is about 5 KMs from here. Legend has it that a part of the lake was blessed by Guru Nanak, and that part of the lake has not frozen ever since.